I do not know what I saw. But I do know it was something that should not have been there and it will remain with me the rest of my life. I was turkey hunting 1 morning approximately 4 years ago. I have never told my story due to I feel people will not believe me. It rained all night long that night and thus it allowed me to walk into the forest in complete silence (No leaves crackling etc.) I set up on a hill side over looking a small creek and valley. It was nearly pitch black due to the overcast sky but soon the rain stopped and the forest became brighter. Soon after I realized I was sitting within 15 feet of several birds that were roosted in a tree next to me. I didnt know they were there until they started shaking the rain off. My gun was already propped on my knee and pointed at my decoy. As things became brighter I could make out most of the valley floor and I continued to watch the birds roosted next to me. Soon after 1 of the birds gobbled I began hearing something off in the distance almost immediately after. I only remember this because it was a very strange paced sound. The rythym of it seemed odd. Nothing I could think of would make a sound like this. I could see down the valley to my right for a fairly long distance however, to my left a seperate hillside came out and I could not see up the valley in that direction. The noise continued with almost near perfect rythym for several minutes with only occasional breaks. It continued to get louder. I soon realized the sound I was hearing was coming from up the valley in the direction I could not see. The turkeys in their roost next to me stopped gobbling and remained silent. A few moments later the forest was becoming fairly bright and I could see most everything around me. All of the birds roosted in the tree flew down and hit the forest floor running. They didnt even seem to notice the decoy. I remained perfectly still watching the birds run through the forest down to my right through the valley. They acted as though something spooked them. At first I thought maybe it was me that spooked them but then it occured to me the sound had stopped about the same time the birds took off. As soon as the birds were out of sight the noise began again. I remained still leaning against a large ash tree. Maybe 1 minute after I lost sight of the birds the sound was becoming much louder and apparent of what it might be. My first instinct was that another hunter was walking through the forest. However, to this day I will never forget what I saw in the coming moments. The sound with an almost steady rythym reminded me of what it would sound like if I were walking on dry leaves in the forest. There was not a drop of wind on this morning and I believe the valley might have been echoing the sound. A few moments later I caught sight of it. Maybe 50 yards to my left coming into view on the bottom edge of the valley. At first I thought it was a hunter in a gilly suit. But upon closer examination I realized this was no human wearing a camo outfit. It continued to walk up right on two feet down the valley towards my right. When the creature got to the bottom of the hill out cropping I was sitting on it stopped dead in its tracks and remained perfectly still momentarily. I think it was as this point I truly realized what I was seeing. When it stopped and stood still it became nearly invisible in the forest. It seemed an eternity passed while I sat against this tree uncontrollably shaking. I was scared out of my wits even with a 10GA shotgun propped on my knee pointed in the direction of the creature. What happened next scared me so bad I would have bet my life on it that was going to have a heart attack. The creature turned its head and looked directly at me. I stared directly into the eyes of this creature for an unkown amount of time. It made no sound, it did not move, only stared at me. I was in full camoflauge including a facemask so maybe it was not sure what I was?? Shaking so bad at this point the only thing I could think of was to defend myself. I clicked the saftey off on my shotgun. When I did this the creature went into an almmost crouching position only it seemed more like it was in a position that would allow it to move quickly. The stare down went on for what seemed forever. I readied my shotgun not afraid to move anymore since it was apparent I had been seen. When I positioned my left hand under the forearm of my shotgun the creature sprang up nearly causing me to pull the trigger. It continued its walk though the forest with its head turned watching me. I continued pointing my gun at it. I never pulled the trigger. I was so afraid I didnt know what to do. Eventually I lost sight of it. I jumped up as soon as it was gone and I ran back to my truck without stopping to rest once. To this day I will never forget what I saw or the feeling of absolute terror that overcame me. I do not want to be famous nor do I want my story posted all over the internet. I just thought I should tell somebody my story. Wow! Consider yourself one of the lucky ones to witness this event. I can't imagine the fear, but I agree with Mary, you are one of the lucky ones to have seen what you saw. 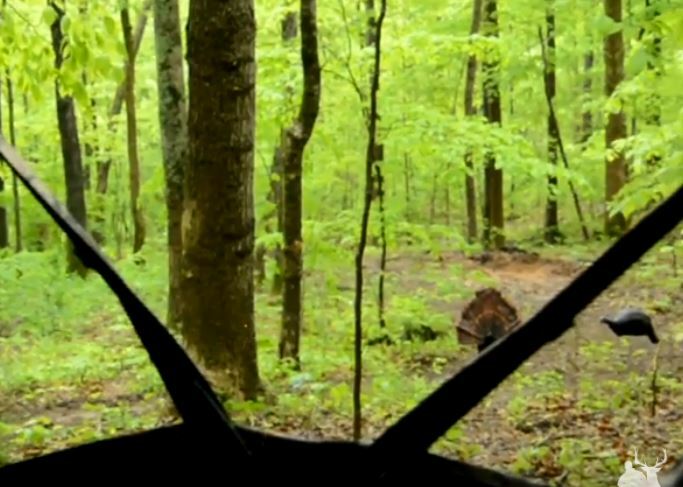 If the hunter himself was able to walk through the woods, in his own words, silently, due to the rain the previous night, how was he able to hear something walking through the woods on the same wet leaves? Just my thought. Lol Why do people choose to learn tbe hard way. The evidence supporting thier existence spans hundreds of years will literally thousounds of stories with the exact same descriptions and mannerisms. I know this forest very well, while Turkey and deer hunting , i have heard some very disturbing sounds come from this place.